The Murtoa water tower is located next to Murtoa's railway station. The water tower once supplied water for the steam engines that passed through Murtoa daily. Construction of the Water Tower started in 1885 and was finished in 1886. It is about 12.8 metres high, and a wrought iron tank which sits on top has a capacity of neary 182,000 litres of water. 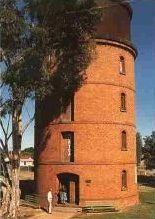 Today the Water Tower houses the Murtoa and District Historical Society archives and a wide range of items relating to the early days of the area.